After the leather day this afternoon, I was thinking again about an artist who has kept cropping up over my research, but who I’ve not followed up yet. This is Michael Brennand-Wood. He describes himself as ‘an artist with a sustained interest in textiles’. He makes vibrant pieces that are part sculpture, part textiles with elaborate visual patterns which mask more profound meanings. He puts into practice some of the embryonic thoughts I have at the moment, about mixing up materials using a range of textile-based techniques and paint. I particularly like the use of the paint! His website notes that “A defining characteristic of his work has been a sustained commitment to the conceptual synthesis of contemporary and historical sources, in particular the exploration of three-dimensional line, structure and pattern. 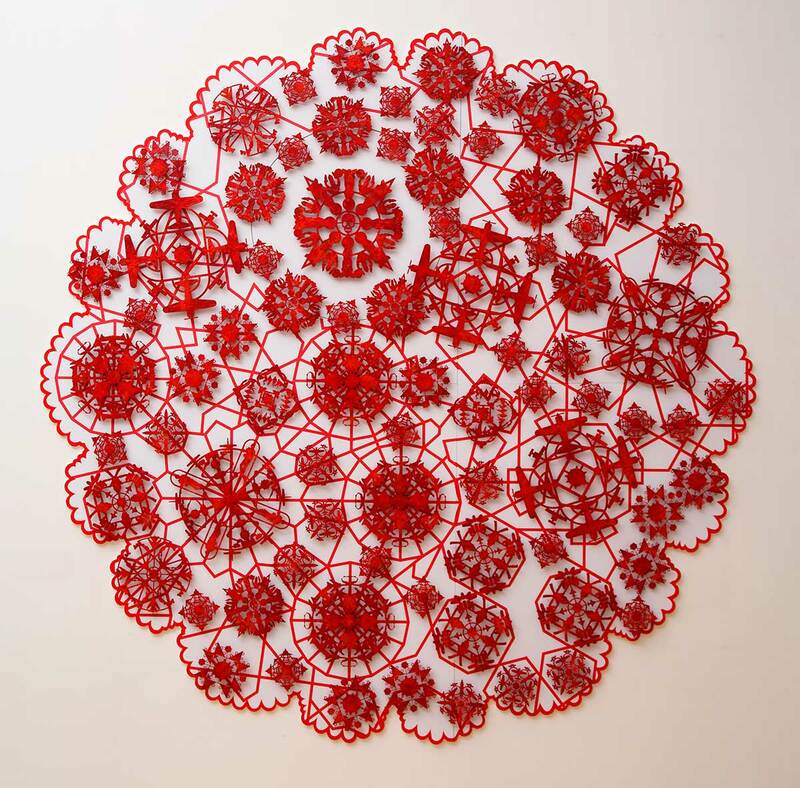 He has persistently worked within contested areas of textile practice, embroidery, pattern, lace and recently floral imagery. Sites, which offer unbroken traditions, cross cultural interventions and a freedom to work outside the mainstream. He believes that the most innovative contemporary textiles emanate from an assured understanding of both textile technique and history. Very interesting stuff! I very much like the idea of layering pieces on top of each other – this is part of my love of quilting after all. Perhaps using a range of embroidery and weaving techniques interspersed with each other. This could give my work a depth of space which ‘flat quilting’ has not yet provided me with. Hmm…. Very interesting – I am suddenly feeling rather surprised that all of these ideas have emerged from just two hours stitching a three inch piece of leather…. creativity works in mysterious ways. I will let this stew for a day or so before writing my new intent cards and getting some inspired making done (Hopefully!). This entry was posted in 04.1 Artists references and tagged Michael Brennand-Wood, textiles on 20 January,2015 by antalbot.